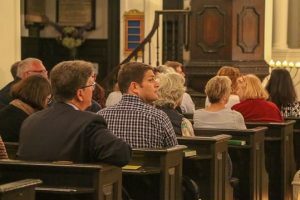 The Worshipful Company of Glass Sellers of London Charity’s fundraising concert on 10 October was a truly memorable evening. 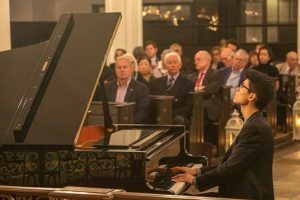 Members and friends were joined by charity beneficiaries, Glass Sellers Scholar Shadman Khan and teachers from Vittoria Primary School, to hear the 2017 Glass Sellers’ Beethoven Piano Prize winner and friends perform at the beautiful Grosvenor Chapel in Mayfair. Joon Yoon (Piano), Amarins Wierdsma (Violin) and Ben Tarlton (Cello) gave polished and impressive performances. Joon began the programme with Beethoven’s Sonata for Piano No. 30 in E major, Op. 10. It was a melodic and elegant start to the evening. This was followed by two further Beethoven Sonatas – No. 8 in G major, Op. 30 No. 3 for Violin and Piano and No. 4 in C major, Op. 102, No. 1 for Cello and Piano. The second half of Joon’s specially curated programme was intended to be fun and energetic and started with Liszt’s Grandes études de Paganini No. 3 “La Campanella”. 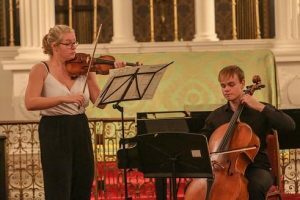 It was followed by Handel-Halvorsen’ Passacaglia for Violin and Cello. The grand finale was Astor Piazzolla’s Four Seasons of Buenos Aires for Piano Trio. A dramatic and passionate performance of, possibly, the best-known composition by the ‘King of Tango’. Joon, Amarins and Ben received a standing ovation for their mesmerising performance. A perfect end to the evening. Thanks to the generosity of an external sponsor, who wishes to remain anonymous, all proceeds from ticket sales will go to the Charity Fund to support its excellent work.